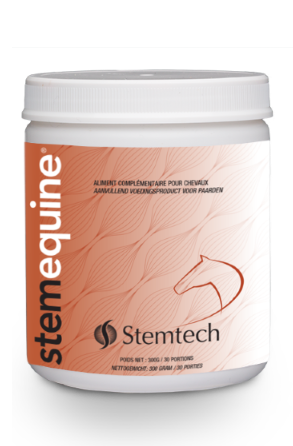 StemEquine® is a complementary food supplement formulated specifically for horses. Fully composed of natural ingredients, it is the equivalent of SE2 for humans. StemEquine is a granulated formula simply add this to your horses daily feed. StemEquine® is the first supplementary food in its category made from natural ingredients that helps your horse to renew and maintain its natural well-being. StemEquine has an exclusive patented formula composed of AFA, Cordyceps sinensis and Undaria pinnatifida, three ingredients that act together to release inner potential.